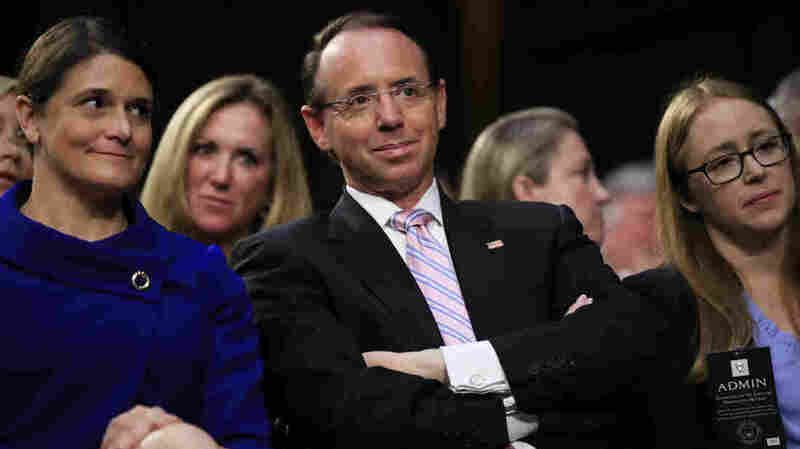 Trump: I'd Prefer To Keep Rosenstein, May Delay Planned Meeting On His Fate The president responded to a question by NPR's Ayesha Rascoe by citing Deputy Attorney General Rosenstein's denials of comments attributed to him in a recent bombshell news report. Deputy Attorney General Rod Rosenstein, center, may get a reprieve after a scare this week in which he expected to be fired. Trump told reporters in New York City in response to a question from NPR's Ayesha Rascoe that Rosenstein "never said" the things attributed to him in a New York Times report from last week and that Rosenstein "doesn't believe" that Trump needs to be removed from power under the 25th Amendment. Those details in the Times report – which Rosenstein denied – prompted him to visit the White House on Monday with the expectation that he was going to be fired. But after a phone conversation with Trump in New York, and meetings in person with White House officials in Washington, Rosenstein returned to Justice Department headquarters with his job and an appointment to return to the White House on Thursday. Now, Trump says, he wants to focus his attention on the hearing scheduled with his nominee for the Supreme Court, Judge Brett Kavanaugh, and a woman who has accused him of sexual assault more than 30 years ago when they were in high school. That's why he said he may call Rosenstein and "ask for a little delay for this meeting." The president's comments appeared to be good news for Rosenstein, who has been a political target of Trump and his allies in Congress for months. They have scourged Rosenstein over his role supervising the ongoing Russia investigation, which Trump also broached in his press conference on Wednesday. The president repeated there had been "no collusion" between him or his campaign and the Russian attack on the 2016 election and "no obstruction" of that investigation — which Rosenstein appointed special counsel Robert Mueller to lead after Trump fired FBI Director James Comey in May 2017. Trump acknowledged that he speaks out and takes other actions in response to events, but said that isn't against the law. "There's no obstruction except for the fact that I fight back, if you call that obstruction," he said. The investigation of Russian election interference is a "witch hunt," as Trump repeated, but he also said he would "much prefer to keep Rod Rosenstein" as the second-in-command at the Justice Department. The question now is for how much longer. Discussion has swirled about Trump replacing Rosenstein or Attorney General Jeff Sessions, another favorite presidential political punching bag, on or after Election Day in November. The leaders of the Senate Judiciary Committee, who at one time said they would not entertain a potential replacement for Sessions, now have softened that stance and signaled that they might be open to a new attorney general. It isn't clear what the congressional response might be to vacancies in both of the top two Justice Department positions.